We are excited to announce a brand new program tailored specifically to high school athletes, allowing them to compete at a higher level by progressing strength, speed, and academics. This program is created and run by Shaun and Karen Hazelton, who were both college level student athletes and understand the challenges of balancing athletics and education. They realize the importance of good preparation on and off the playing field, and are very serious about providing the highest level of coaching and individualized tutoring for your student. SPEED - Learn to accelerate, decelerate, and apply proper force through the ground. EXPLOSIVE POWER - Gain explosiveness through plyometric progressions. STRENGTH - Sound technique taught for upper body, lower body, and core strengthening. CONDITIONING - General physical preparedness for athletes of all sports. FLEXIBILITY - Various forms of myofascial release and stretching to improve functional range of motion. INJURY PREVENTION - Identify & correct muscular imbalances and incorrect movement patterns. 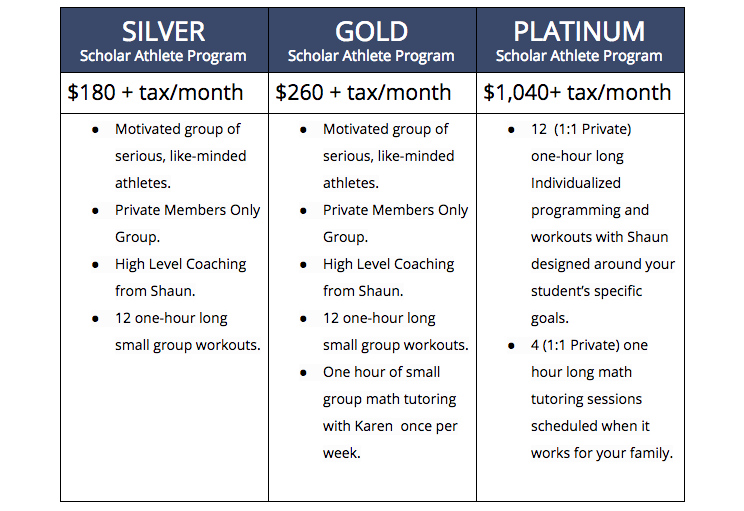 CONFIDENCE IN MATH - Small group math tutoring is included in the price of the course for Gold and Platinum packages. ACT/SAT math prep too! Shaun has been lifting seriously in the weight room since eighth grade and has seen the direct impact good coaching has on athletes at a young age. Shaun played football for Western State College of Colorado, where he graduated with degrees in exercise science and psychology. After college, he began competing in CrossFit, where he qualified five consecutive times for regionals. Shaun has ten years of experience as a strength & conditioning coach, and wants to pass on this knowledge to young athletes to help them succeed on their field of play. Karen is a licensed secondary math teacher with eight years of math teaching experience at Catalina Foothills and University High Schools in Tucson. She has also had extensive experience with one-on-one and small group tutoring for high school math students. Karen grew up playing competitive tennis and earned a scholarship to play Division I tennis at University of Northern Colorado.